Governmental Affairs | Francis, Edward, & Cronin, Inc. The days of the smoky back room are ending. Elected and appointed officials are concerned with how their actions will affect their constituents. We are aware of this and have the ability to work with clients to use both their internal resources and our professional assistance to affect change in a legislative or political arena. Francis, Edward, & Cronin, Inc designs plans and strategies that allow clients to use their own staff and supporters to act as their own lobbyists and spokespeople, while being supported by professional lobbying assistance from us. Governmental officials want to hear from people whose day to day lives could be changed for better or worse because of their actions. 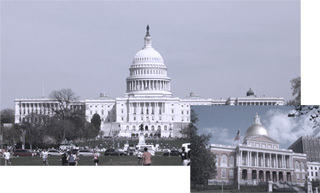 • advocate to, and engage with, legislative and administration officials and their staffs. The most effective and articulate spokespeople are those who are affected by a governmental action. We, knowing this, can design a government affairs strategy which allows a client to act on its own behalf, but yet acts with the support of a firm experienced in governmental affairs, lobbying, and the role of constituents in forming government policy.